In January of 2014 Kevin Hart continued his roll of starring in every comedy imaginable and out of all those attempts hit franchise gold in one of them. Cut to two years later and we will receive the sequel to Ride Along. Director Tim Story (Barbershop, Fantastic Four, Think Like A Man-the guy apparently knows sequels) has reunited Hart with Ice Cube and the first trailer just so happened to drop today, on the eve of the release of Straight Outta Compton. The original was average at best, but this time around Hart and Cube are taking their antics to Miami and some of the bits at play here have some strong potential (though I wish they wouldn't have given away as many). The Tyrese cameo, for instance, seems pointless to have in the trailer given he doesn't say a word, but would serve as a nice surprise when they infiltrate the Miami street racing scene (let's just hope Ludacris is on board too). Maybe with cinematic universes becoming such hip things Hart and Cube's characters could eventually team-up with Will Smith's Mike Lowrey and Martin Lawrence's Marcus Burnett, but given we're talking different studios that seems unlikely (I would love to see Lawrence and Hart in a comedy together, though). That said, it does feel like this unnecessary but warranted sequel is trying to emulate the Michael Bay production with the Miami police force aspect that introduces characters played by Olivia Munn and Ken Jeong. Regardless of if this turns out to be utter crap or not, I can't help but laugh at Ice Cube getting angry so I'll no doubt end up seeing it for that alone. Ride Along 2 also stars Benjamin Bratt, Glen Powell, Bruce McGill, Tika Sumpter Sherri Shepherd and opens on January 15, 2016. 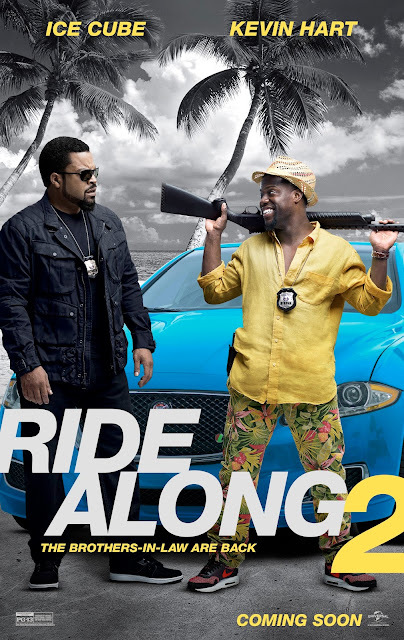 Synopsis: Kevin Hart and Ice Cube lead the returning lineup of Ride Along 2, the sequel to the blockbuster action-comedy that gave us the year’s most popular comedy duo. Joining Hart and Cube for the next chapter of the series are director Tim Story, as well as Cube’s fellow producers—Will Packer, Matt Alvarez and Larry Brezner—who will produce alongside Cube.